I awoke this morning craving spaghetti and meat balls. But the thing with that is that it HAD to be meatballs. It wasn’t until I talked to Kristen about noon that I figured out why and what day it was. Daddy would have been 79 years young today. His birthday dinner was always his favorite food…..Kraft Spaghetti Dinner with homemade meatballs. I find it strange that with his and mother’s birthdays I find myself deep in thought for about a week before they arrive. Like we have been chatting in the subconscious about what is going on in my life, the changes I need to make, the things that I need to do to make my life better. The past couple of weeks, my mind seems to be awakening to the fact that at some point in all this hubbub I sat down and just quit. It has been as if I just turned everything off. I know that I have to get up and carry on. I have come to realize just what a big piece of myself left that day. You see, Daddy wasn’t just a Dad. He had fought for every breath I took in life, from birth he fought for me to be alive and healthy. He was my fierce protector, my lobbiest, my confidant, my mentor and most of all he was my very best friend. A calm in the storm of life. I only pray that I can be all that to my daughter as well. That is the key, that is the motivator is I need to be all those things to the most precious person in my life. So, instead of me giving him a birthday present it seems that he has given me one instead. Happy Birthday my Precious Daddy, you touch my heart and thoughts on a daily basis and seems even from afar you help to guide me in the right direction. I love you Dad. I parked my truck up against the gate, on a drive-way that barely exists any more. I rolled down the windows, turned off the ignition and chucked my cell phone and blue tooth in the seat. The morning sun was shining and I needed to feel it on my face. Stepping from the truck on the quiet, two lane country road I stopped to listen to the sounds of the countryside. Stepping from the asphalts edge into the tall grasses yellowed with the winter cold, I seemed to have stepped into another time and space. 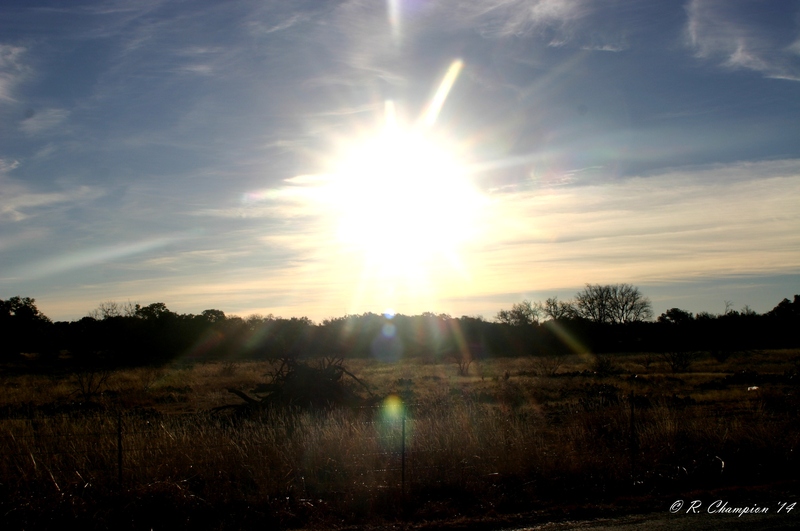 Watching the sun make the sky and clouds stream with color a tear drop escaped my eye. By the time I had wandered down the ditch to the guardrail over the creek to sit quietly in the beautiful surroundings, more tears escaped and blanketed my face in the cool morning breeze. My heart felt a plethora of emotions. I was saddened by losses of loved ones, not just of my own but of friends too. I was exhilarated and excited at upcoming births and marriages. I was softly being thankful for all of the blessings in my life and hoping that other people I know were finding their own this morning. I thought back over the years and all the people and places that have filled my heart and touched my soul. 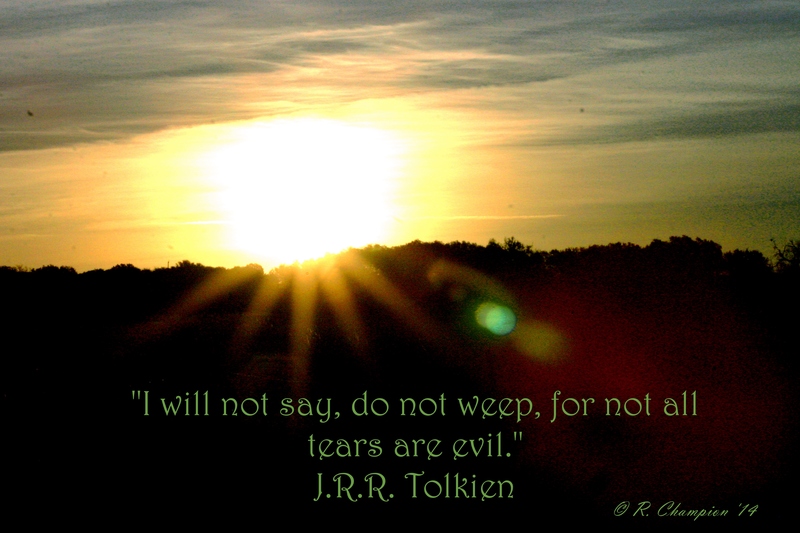 Mr. Tolkien says it best when he states “not all tears are evil.” What a wonderful healing, filling, and blessed morning. Tears shed for those I know and for those I don’t.